This introductory essay provides general background information on the institutional differences between regulated Community Development Finance Institutions (CDFIs) and mainstream financial institutions. 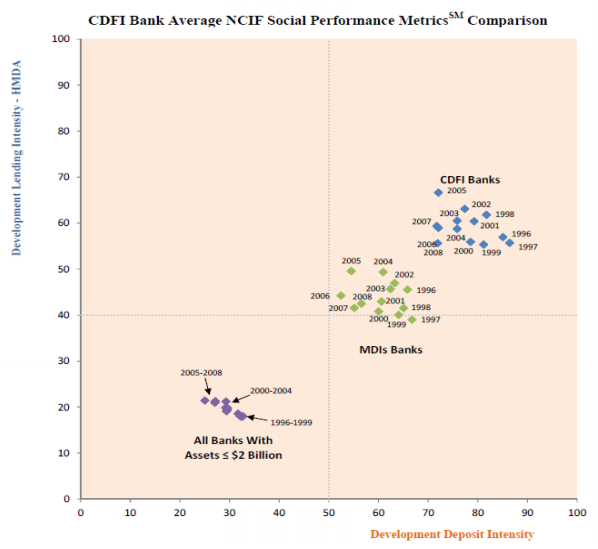 It sets the context for understanding the objections and results of two evaluation studies that can provide insights into the research question of whether CDFIs present greater risk of institutional failure, greater vulnerability to mortgage market downturns, or are less efficient than “mainstream” financial institutions. These include, first, a logistic regression model of the risks of institutional failure within 2 years and the potential for failure of CDFIs compared to mainstream financial entities in the event of a mortgage market collapse; and second, a Data Envelopment Analysis (DEA) that compares the operating efficiency of CDFIs with mainstream financial lenders. Taken together these evaluations indicate that CDFIs show no greater risks of institutional failure than similar “mainstream” peer institutions. Further, given the markets in which CDFIs tend to operate, their overall efficiency and institutional stability is noteworthy. The primary objective of these research studies is to assist in the evaluation of the CDFI program. The purpose of this evaluation is to determine empirically and through a review of the state-of-art literature whether CDFIs have a higher risk of institutional failure than mainstream financial institutions. This is an especially interesting question given that so many CDFIs target their service efforts to poor and low-income communities, which are perceived a priori to be more risky markets for financial institutions to venture. To meet this objective, we conducted two research studies that can provide insights into the main research questions—first, whether CDFIs present greater risk of institutional failure, including vulnerability to mortgage market downturns, and second whether CDFIs are less efficient than “mainstream” financial institutions. We believe our results are individually rigorous, and cumulatively revealing. These analyses, which readers will find below include: an expansion and improvement on a logistic regression model we have used in our past research on CDFIs (Fairchild & Jia, 2012); an additional improvement to this model that allows for an evaluation of the performance of CDFIs compared to mainstream financial entities in the area of mortgage market systemic risk, and a Data Envelopment Analysis (DEA) comparing the operational efficiency of CDFIs with mainstream financial lenders. We feel that in sum, our results indicate that CDFIs are at no greater risk for institutional failure and are no less efficient than their “mainstream” counterparts, once analytical procedures control for size, scope and institutional differences. In fact, in some of our results, CDFIs appear to be less at risk of institutional failure. Recognizing the old adage that “for every problem, the needed tool may not be a hammer,” We have taken a multi-disciplinary and multi-method approach to investigate whether our logistic regression model, our mortgage market system risk models and our operational efficiency models can empirically show if CDFIs are measure such risks compared to mainstream financial institutions. We feel that our models are robust, and invite comments from academic and practical readers. Our ultimate objective is that these methods are applied to better the service of financial institutions to communities and consumers that would otherwise go overlooked. The audience of this report is necessarily mixed. We anticipate potential readers including elected officials, members working in roles within executive branches of government agencies and regulatory bodies. In short, we anticipate a readership with primarily practical, rather than scholarly interests. As a result, we have drafted our evaluation in an accessible, and yet professional language. We have labored to give examples of the methods we use that are recognizable to laymen, have provided our statistical results in that fashion, and have provided extensive data and methodological appendices for those interested in greater detail, or explanations of our methods more common to academic audiences.